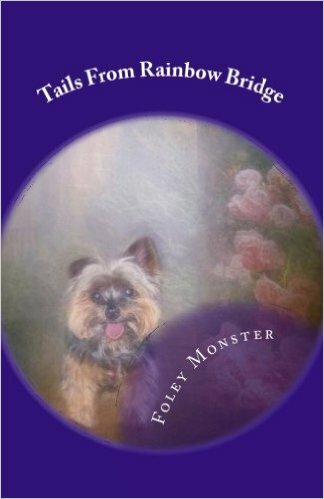 Humans rarely make a harder decision than when they send their beloved dog to the Bridge. When our parents see us they feel joy and contentment in their hearts. It is an addictive sensation. When we are gone their body craves that feeling. The withdrawal is devastating. Our parents wish to see us just one more time and feel that joy and contentment again. There is little that can be done to ease a parent's suffering. Sometimes a strong belief that the pup is somewhere beyond their parent’s comprehension, and that there will be a parent and child reunion in the future, helps. So does the knowledge that the new angel has a loved one waiting on them. When two dogs are playing one plus one equals three. This being is created when two loving souls are together. There is me, you and us. No one can see or touch this third being. When one partner leaves, the mourners cry for two, one for the departed, and one for the couple that has now been halved. Enter Marshmallow, Aunt Jodi's adorable little fur white fur ball. She was born the day after her parents’ wedding. She was a delightful way to begin a family. It seems the more a dog is loved, the more names they acquire during their lifetime. Marshmallow was also known as Marshie, TM and most affectionately Baby Face. Marshmallow became a part of her parents. 'lives at eight months and made the duo a family. A people dog, Marshie yearned to be friends with every soul she encountered. She loved dressing up and twice took part in the Human Rescue Alliance fashion show fundraiser. Marshie welcomed every dog who entered her pack but made sure they knew she was the leader and that her kindness was never misconstrued as weakness. She inspired a great love for dogs in her parents’ hearts. Because of Marshie, they began to help homeless dogs through rescuing and fostering. A year after Marshmallow made the newlyweds into a family Ricotta joined the pack. They were instantly inseparable — the personification of how one and one becomes three. Their parents loved what the two of them were like as a couple as much as they did the singular dog. For nearly a decade the antics of these two tiny white dogs brought smiles to whoever saw them. Then, sadly Ricotta was claimed by the Bridge. Marshmallow was still the same loving dog she had been, but she bore a tinge of sadness in her later years. When it was Marshmallow turn to follow her brother to the Bridge, her mom was faced with her hardest time, saying goodbye to the baby whose life spanned that of her marriage. When Marshmallow was saying her final goodbyes, Ricotta and I were waiting for her. Ricotta's rapidly wagging trail against the blue sky, served as a beacon for his sister, who suddenly appeared running across the Bridge, then up the stairs, anxious to be reunited with her sweet brother. I had to quickly give her the oath. I knew her desire to reunite with her brother trumped all. When I was done, Marshmallow ran at Ricotta, kicking up the green grass behind her. They hugged, kissed, then began rolling around, nipping at one another. They barely noticed the tear clouds that rained down upon them and wet their coats. They both stood, Ricotta gave Marshmallow a sly look, and they bolted towards the mountains laughing and singing all the way. They would stop and lie back to back, breathing hard, their tongues hanging out of the side of their mouths, then they would stand and run off again. I announced to the others in the greeting committee, those who had Marshmallow’s wings, those who wanted to give flying lessons and some who just wanted to say hi that they should return to their homes. Everything Marshmallow needed to learn could be taught by her brother. The next morning I heard the sound of two excitable little dogs outside my door. I opened it and saw Marshmallow and Ricotta still breathing hard from playing. Marshmallow said they had flown into their mom's dreams but could not make her happy. I told them to keep loving each other and the third that is created by their bond, that is not bound to an angel's code, will be able to touch their Mama's heart and let her know that her babies were together safe and happy. Marshmallow and Ricotta said that they would try and then happily ran into the sunrise. We are so glad their reunion was a tail wagging good one! Marshmallow and Ricotta are inspirational. A bittersweet reunion. We hope their Mama will fill some joy in her heart soon.